I was born in Florida in 1979 into a family of three sisters and my Canadian mother, Jeanine Paquet (Mamata). We left Florida when I was still a baby, to move to coastal British Columbia. My mother and I, along with her two sisters and their children all lived in a big house in Cloverdale. 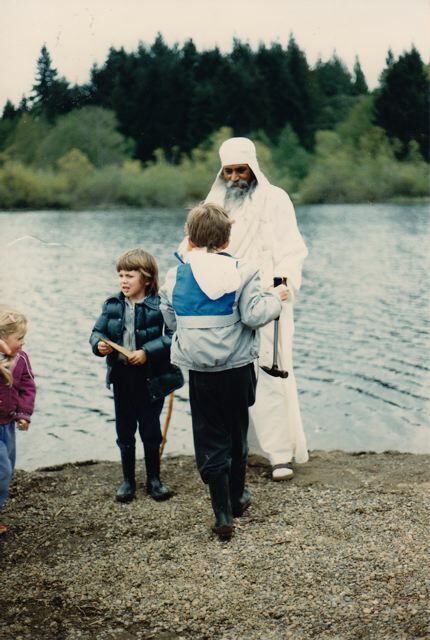 In 1982 my mother saw a posting on a community board in the local health food store about a retreat with Baba Hari Dass on Salt Spring Island. This was the first she’d heard of Babaji, the Salt Spring Centre, and the island … and it was the beginning of my long experience with the Centre. As long as I can remember the Centre has always felt like my home. After attending that retreat in 1982 my mother decided to move us to the Centre, and we became the first family to live on the property. Shortly after, Sid and Sharada moved into their home along with Nayana and Daya. Mangala came later with Ariel and Caleb, and Maya and Piet lived there for a time with their dad, Marc. My mother and I lived in the main house in various rooms upstairs over the years. Nayana and I were the best of friends in those early years, and we had the run of the whole land all to ourselves. I would frequently wake up at the crack of dawn before everyone else, run down to Nayana’s house, and steal her clogs (they were made of blue transparent plastic). Well, they were attractive and I liked wearing them! Each time I did this my mother insisted I return them before receiving breakfast. When I was two or three Nayana and I decided to get married, and she wore a twist-tie wedding ring to show it. I believe we later divorced. Caleb, Ariel, Jeramiah, 1985 or 86. Growing up at the Centre was like having a very large family, which was a gift to me as most of my family lived across the country and were not a part of my life. In 1984 I began my first year of school at the Centre School, where I continued on for at least half of my primary education. Back then, there were a dozen or so of us downstairs in a large room, which has now been divided up into KY quarters. 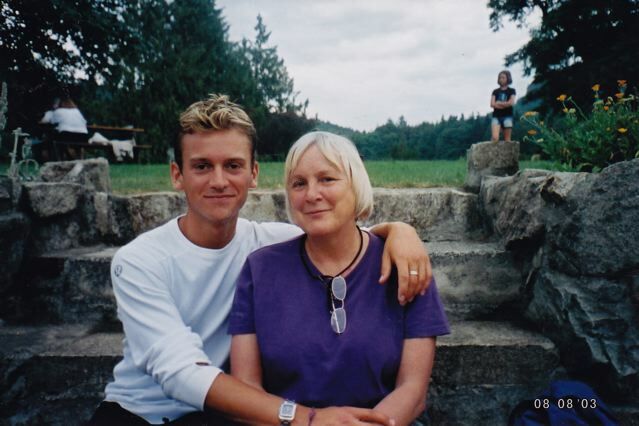 My mother and I moved off the centre property, only to return a few years later for another stint when I was 7 years old. Whether we were living at the centre or elsewhere on the island, the Centre continued to play a major role in my life. I attended school and we participated in weekly satsang and regular retreats. Of course, as a child, satsang and retreats just meant really awesome extended play time and visits from Babaji! He was like a grandfather to us as children. I remember getting so excited to receive the daily Prasad candy. One time I stood at the foot of the stairs outside of the kitchen – I couldn’t have been older than 3 or 4 – with Anuradha and Babaji at the top of the stairs looking down. I insisted that I hadn’t received my daily candy yet (which I believed to be true). I was devastated when they both agreed that I had already had my candy for the day and denied me any more! I was sure they were mistaken, but Sharada says Babaji always kept track and was surely correct. I remember there always being so much going on in those early days of the community. I remember epic Halloween parties (there are photos in the library to prove it), retreats, countless festivals, and of course who can forget the original Hanuman Olympics?! Sack races, tug of war, obstacle courses … it was undoubtedly one of the highlights of every year for all of us. In my later years at the Centre school our classroom was upstairs in the Satsang room and the library (which we called the piano room back then). There were no permanent fixtures in the classroom, only bookshelves on wheels that got turned around for weekend programs. Usha, being the teacher that she is, didn’t need any extra gimmicks! There were about 14 of us as I recall. Usha was an innovative and passionate teacher who brought us an education unlike what most kids would experience in public schools. In particular I remember being taught peaceful resolution to conflict. Each day we would sit in a large circle and Usha would dip into our ‘feedback box’ and pull out any slips that had been deposited by us kids. She would read the slip aloud, and the parties involved were coached on how to communicate their feelings and resolve the conflict with each other. At lunchtime we would all run around the property with great excitement and complete freedom. We created forts, which soon turned into a full blown village called ‘The Bunny Homes’, complete with real estate agents, shopkeepers, police officers, restaurants and our own currency. Apparently the Bunny Homes still exist today, although the form and location has changed. We would also run down to the creek when it flowed in cooler months. Inevitably at least one of us would fall in each day, and would spend the afternoon wrapped in a towel in class while our clothes dried in the dryer. When the school bell broke (it was a handheld old style metal bell) Usha would come outside at the end of lunchtime and sing, in her beautiful Usha style, ‘Ding-aling-aling time’. We would all protest and beg for ‘5 more minutes’! Occasionally, but not often, our request was granted. 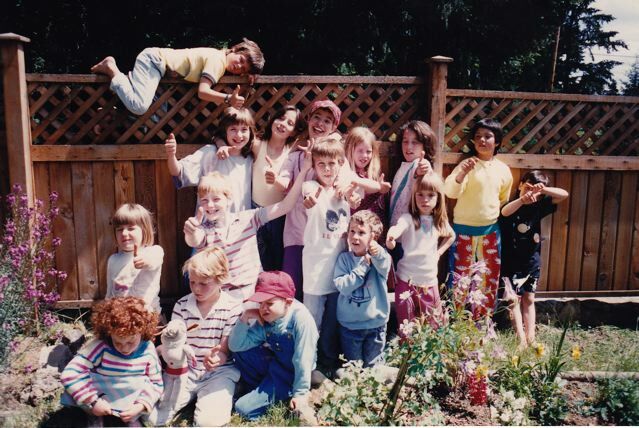 In 1990 I left the Centre School to attend French Immersion at Salt Spring Elementary. 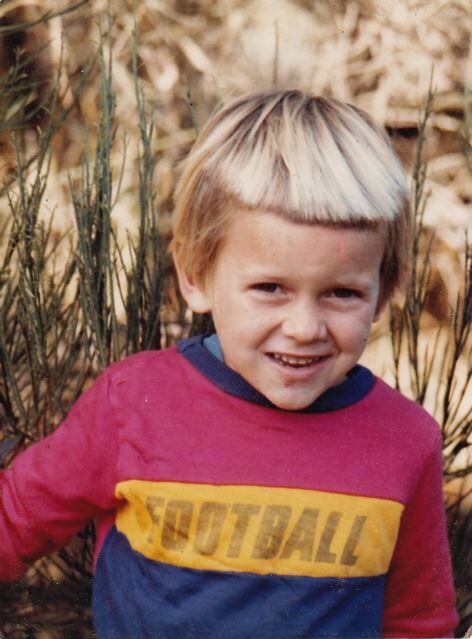 I can recall feeling a little out of place in such a traditional setting, and it took some time for me to adapt to the normal schoolyard bullying and games that simply didn’t exist in our Centre School. 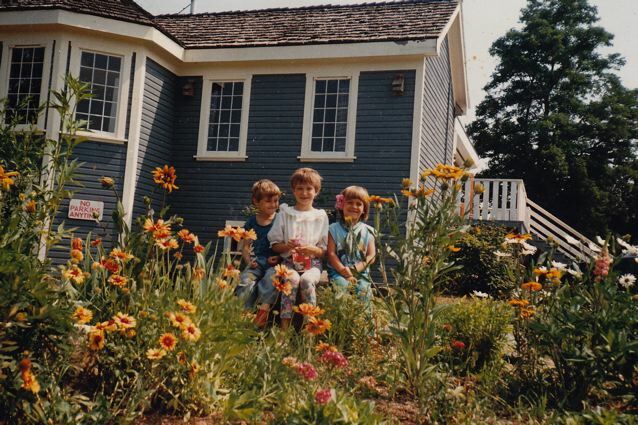 In 1992 we left the island to move to Kaslo in the Kootenays where my mother had purchased land and a home. This began a long gap in time where I didn’t see much of the Centre. I kept in touch with some friends, and occasionally would come back for visits, but we didn’t attend retreats for many years. It was in 2002 that I re-established a strong connection to the Centre that has endured until today. I had been living in Vancouver attending college and working, and then living in Florida for a year. I moved back to BC at age 22 with a broken heart after ending my first relationship. Being in a state of pain and loss, I began to explore my own spirituality for the first time as an adult. That year I attended the retreat as a participant and Karma Yogi for the first time. 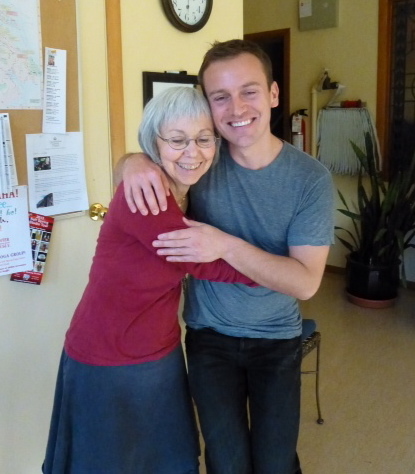 I attended my first asana class with Lila, an elder who taught well into her eighties. I will always remember her words in class, spoken in her gentle German accent, ‘Your body loves to be loved. Give your body love. There are no real excuses. Why wouldn’t you practice asana and give your body the love it wants to receive?’ This was the beginning of what would become a deep and disciplined yoga practice. During the retreats of 2002 and onwards I reconnected with many childhood friends. In those years Babaji was still attending the retreats, and I did KY on rock crew on all of its many construction projects. I also worked in childcare and dish crew. 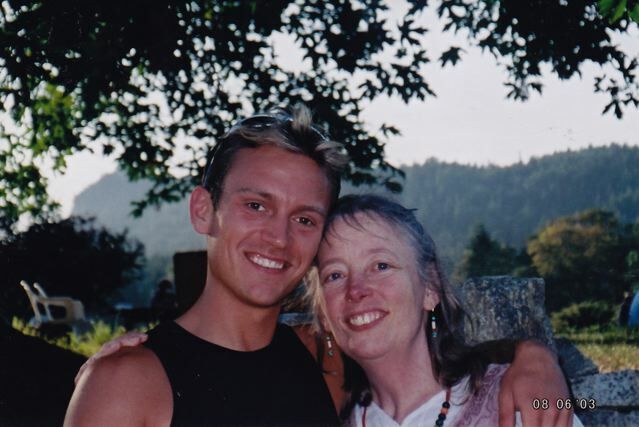 In 2003 I attended the Yoga Teacher Training program at the Salt Spring Centre thanks to a very generous scholarship from a longtime satsang member. This was an incredible education into all aspects of ashtanga yoga as taught by Babaji, and it shaped my yoga practice and my life thereafter. Later that year I traveled to Mount Madonna Centre in California to attend a two-month Karma Yoga program. Getting to know Babaji and his teachings took on a whole new form in that period of my life. As a young adult I was eager to learn all that I could from him. It is perhaps the greatest gift of my life to have known him from such a young age: to have sat beside him at mealtime, to have heard his teachings in Gita class, and to have worked with him on rock crew and other projects. Because of this, yoga has always been an integral part of my life and I don’t remember a time that it wasn’t, in some shape or form. In 2003 I also began a career at lululemon athletica which would span nearly 10 years. When I began it was a small startup company based in Kitsilano with 5 stores in Canada selling yoga apparel. I began as a salesperson on the retail floor, and I expected to remain for only a month or two! I later became a valued member of the senior leadership team based in the Vancouver head office and traveling across North America. In the early years of the company we created a company culture based on many aspects of yoga, including ego awareness, communication, asana practice and more. My yoga practice and knowledge that I had learned from Babaji’s teachings was a great asset and influenced my leadership at lululemon. Without it, I’m not sure I would have progressed as far as I did with the organization. By 2010 I was beginning to see that my time at lululemon was coming to a close. I yearned for a life more like the way I had grown up and also more consistent with Babaji’s teachings of living simply. It was a great spiritual yearning that became stronger and stronger, and soon could not be ignored. That same year I met a beautiful yogi. 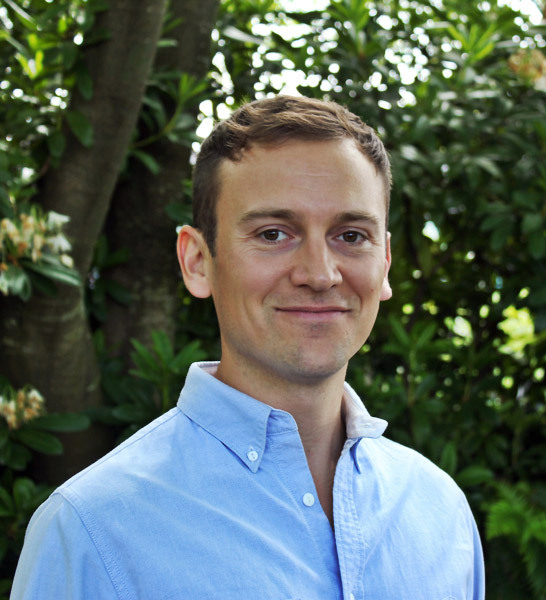 Michael grew up in North Saanich and spent years living overseas and traveling in India before we met. The next year, in 2011, Michael and I were together living in an apartment in Vancouver. We shared a yearning for a simpler life, and in February of 2012 we moved to Salt Spring Island. Later in the year, I bought a 50-acre organic farm on Starks Road which is our home today. As we were pulling blackberry brambles and reclaiming parts of our pasture this spring, I was struck with great respect for all of the work that has gone into the Salt Spring Centre over the years by so many people. In the 30 years I have known it, it has truly transformed and evolved in such a beautiful way. My mother once told me that a guru’s energy can be felt long after his departure from his centre or ashram. I know this to be true at our Centre because I feel it always when I am there. It continues to be a place of peace and restoration for me. I have great gratitude for Babaji and for the many satsang members who helped raise me. We are family! Thanks most of all to my mother for having the wisdom to take us to this special place. 17 thoughts on "Our Satsang Family: Jeramiah Rajesh Morris"
Depending on how you define a family, it was actually Sumitra, Sky and Pitambar who were the first to live at the Centre in winter 1981. Good to know, OmPK! Since I was so young at the time, I dont remember such details so I went with what I was told by others in the satsang family based on how they remember it. What a beautiful, touching story. Thank you Jeramiah for allowing us to peek into your world. Although I’ve known you for over 10 years, I see even deeper into what has shaped you into the gentle, intuitive and hilarious man you are today. It is so much fun hearing stories from the old days when living a s”imple life” in the bushes was the only way we knew to live and never seemed to simple to any of us. Thanks for sharing your story and making me even more aware an greatful for our childhoods and the way we were raised. I would 100% agree that coming back to the centre is always joined by an energy that babaji has exuded all over that piece of property. Wonderful to hear a note from you! I’ll be at the retreat, hope to see you there! Thanks for your story, Rajesh. The Rajesh/Mamata connection will always unite us! Peace! Hope to see more of you, Raj. Jeremiah, I remember when you and your mom lived in a little trailer by what is now, I guess, around where the yurt is? I loved going an visiting the two of you and having chats with your cool mom who seemed to “get” my pre-teen angst, while you decorated your little self in scarves and twist-tie jewelry. (I don’t remember why you were in the trailer – maybe that’s when the centre was being painted / renovated??) Special memories. And so lovely to hear how the rest unfolded for you…. thanks! Thanks for this Daya! I have no memory of a trailer … except for yours and the one Mangala, Caleb, and Ariel lived in which back then was right close to your family’s. I wonder if we stayed there for a while? I just remember you being the ‘cool teenager’. I was in awe of you … and probably a little scared of you! Haha. And you always had the COOLEST hair that all us younger kids admired with great enthusiasm. Sweet that we can still be connected … 30 years later and counting. See you at the retreat? Thank you for sharing Jeremiah! We met last year when you purchased the farm from Sheri (I am the young friend who has worked on the farm for so many years). The Saltspring Centre has played a special part in my life and education, so I feel a kinship with you through both these magical places. I have been to Sheri’s a few times this spring and have not made it up for a visit yet (though admittedly I harvested a few nettles from your forest). I will surely be by soon and would love to walk around and see what you are up to. Lovely to see this note from you, yes come by for a visit on the farm! You are welcome to drop by anytime, or we’ll schedule a time. I would be happy to show you what’s new, and hear more about your experience here, and at the Centre. How could I ever forget the vintage JLO catsuit! I always give you credit for that little wonder, it made the show!! Happy to hear from you. Let me know when you are next on the island! Not sure if you recal me, I was in your 2003 YTT class, and a fellow actress in the YogaQueen skit. What fun that was. Of course I remember! How could I forget a fellow ‘Babba’ member?! I recall your sweet and steady energy in the YTT course, it would be good to cross paths again! Let me know if you are on the island.